Red Brand has been a proud supporter of FFA for 70 years now. From funding SAE grants, to sponsoring National Proficiency Awards and investing in special causes and events, our dedication to this vital organization runs deep. In 2010, we began supporting chapters at the local level through the grass-roots funding program called Home Grown. Since then, checks have been distributed to more than 1,200 local FFA chapters. Each year, more and more chapters become part of the program, generating dollars that are directly invested into agriculture’s future. Red Brand dealers are invited to register for the program, which runs from January 1 through December 31. 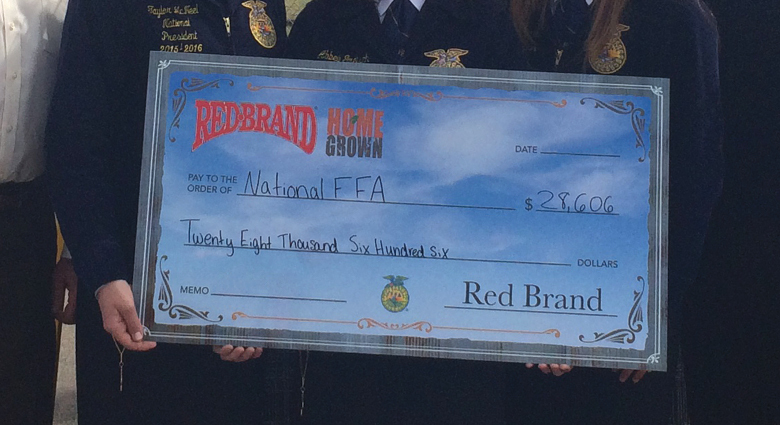 When they sign up, an FFA chapter is designated to receive funding from Red Brand. Home Grown works like this: every time your dealer orders qualifying Red Brand products during the year, up to $1.00 is donated to the local FFA chapter. So, the earlier in the year that dealers enroll, the more time you have to earn money through the program. It’s really that simple. Qualifying fence styles include Red Brand Field Fence, Sheep & Goat Fence, Barbed Wire, Non-Climb and Keepsafe V-Mesh Horse Fence, and Yard, Garden & Kennel fence, which all earn the chapter $1.00 per roll. Red Brand 2×4 Welded Wire and Red Brand Poultry Netting also qualify at fifty cents per roll. Home Grown is available at two levels of sponsorship. The Blue Level is completely free to dealers and comes with marketing materials to help promote the program. The Gold Level sponsorship requires a $750 tax-deductible donation that goes to the National FFA Foundation. With this level of sponsorship, dealers receive up to $5,000 in consumer mail-in rebates, a priority dealer listing, promotional materials, and more. About 900 Red Brand dealers throughout the country are enrolled in Home Grown, each having the potential to make a significant impact on their local FFA. The average amount each chapter receives is around $300, but we recently issued a check for $9,270 to one chapter! So, as you can see, the earning potential of Home Grown is unlimited. You can be part of the success of your local chapter when you help spread the word about Home Grown. Start by talking to your FFA Advisor and your local Red Brand dealer about the program. Once you are enrolled, be sure to share the details with your family, neighbors and friends. You can also distribute this printable promotional flyer throughout your community for additional awareness. It’s a win-win for all. They’ll have the very best in ag fencing while helping to support your local chapter. Check with your Red Brand dealer today to see if your chapter has been selected for funding. If they have already enrolled, be sure to tell them thank you! If they are unaware of the Home Grown program, share this flyer and encourage them to sign up today so you can start earning funds for your chapter. You can find more information about Home Grown here. Low Carbon or High Tensile Fencing? Non-Climb or Keepsafe V-Mesh: Which is Best for My Horse?